Four 38-ton guns are in the dilapidated Fort Delimara but, although they are the only surviving examples in the world, they sit in a metre of pig excrement and slurry. Photo: Chris Sant Fournier. Fort Delimara, which is at risk of collapsing, would probably take 10 years to restore at a cost of millions of euros, according to a voluntary organisation that has offered to take on the tall task. 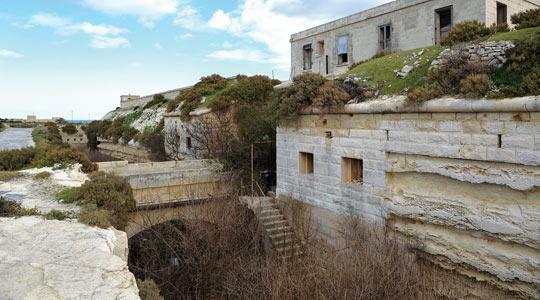 Din l-Art Ħelwa, the heritage trust, has approached Heritage Malta, the national heritage agency, to discuss the possibility of restoring the dilapidated 19th century fort that was used as a pig farm until five years ago. The NGO's president, Martin Galea admitted that the cost and complexity of the job would not make it an easy one. Heritage Malta said they were interested in the offer and the two organisations were discussing all options, he added. The fort was built by the British between 1876 and 1888 as one of a ring of forts and batteries protecting Marsaxlokk harbour. But, in 1982, it was converted into a pig farm and was still used as one right up to 2005, when the government evacuated the place and handed it over to Heritage Malta. It was open to the public for a few months but was then closed because it became a target for vandals. Surrounded by a moat, the fort still houses four 38-ton guns mounted on dwarf carriages. Despite being the only such examples left in the world, they are sitting in a metre deep of pig excrement and slurry. The pig pens used to be located at the top of an incline and all the sludge slipped down to the bottom of the tunnels, where the guns are situated. More worryingly, the cliff rock on which the fort stands is slowly disintegrating inwards due to erosion by the elements. The side facing the sea is being eroded by sea spray. Restoration could easily take 10 years, Mr Galea said, although parts of the fort would be opened before that, granting limited access to the public. With a restoration bill that would run into millions of euros, he said the organisation would consider all options, including looking for EU funding. The dire situation of the fort was highlighted in an article in The Sunday Times last August when a spokesman for the planning authority confirmed that the fortification was subjected to erosion and that no planning applications to remedy the situation had been filed. The fort is not the only one that needs urgent attention. In October, the wall of a bastion collapsed beneath the Argotti Gardens, in Floriana, while Fort St Angelo in Vittoriosa was closed off to the public after cracks appeared in the stonework.